As Speaker of the House, Nancy Pelosi is America's third ranked politician after President Barack Obama and VP Joe Biden. Given Biden's low profile and gaffe prone manner, Pelosi's power, in reality, is probably second only to Obama's. Nancy Pelosi is only a plane crash and a decent heart attack away from the most powerful job in the world. San Francisco based Pelosi is not only one of the richest members of the US Congress-she is also one of the reddest. Joshua Muravchik has exposed Pelosi's admiration for the late covert communist labor boss Harry Bridges. Cliff Kincaid of Accuracy in Media has revealed Pelosi's ties to the pro-communist Hallinan family. Kincaid also points out a major flaw in the US political system. Like the president, House Speaker Nancy Pelosi does not have to go through a background investigation in order to get a security clearance. This loophole in the law enables the president and members of Congress to automatically qualify for security clearances, even if they have controversial backgrounds and associations, by virtue of the fact that they get elected to high office in Washington, D.C. I'm about to start a Pelosi security file series to run in parallel to my widely cited Obama File series. There are many overlaps. 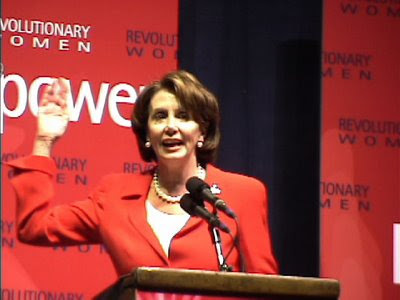 Pelosi is connected to some of the people and organisations that put Obama in the White House. Her job is to run Congress in the way most beneficial to Obama and the socialists who back him. Check out the Pelosi Dossier. That Didn't Last Long Did It?